Sai Volunteers help the needy in many places. One such place is the Exodus Foudation in NSW, which has had links to the Sathya Sai Organisation over many years. We bring you an account of the volunteer service activity at Exodus Foundation. The Exodus Foundation is a charity organisation that seeks to combat disadvantage by providing food, social health and wellbeing assistance to those who need it most. Volunteers from the Sathya Sai Organisation (brothers, sisters, uncles & aunties) are involved in assisting the Loaves and Fishes free restaurant on a monthly basis. 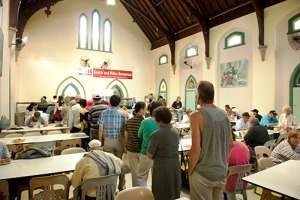 The Loaves and Fishes restaurant has been in existence since the inception of the Exodus Foundation, and they serve meals to about 300 people on daily basis. 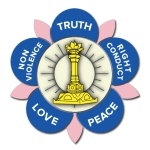 Volunteers from the Sathya Sai Organisation are involved in a variety of ways depending on the needs for the day, but typically our duties are often serving lunch on a Saturdays on a monthly basis. Other volunteering activities include: preparation of utensils for over 300 individuals, packing of utensils for the night van, serving of food and cleaning up in preparation for the next meal. Each month 10-15 volunteers from different centres are involved on a rotating basis, and it is an opportunity that all are keen to be a part of. This is an ongoing project and has inspired the formation and the future potential formation of many other soup kitchens around Sydney.